Kings Corners Free App Data & Review - Games - Apps Rankings! Tired of fart apps? Here's a much better way to play with your iPhone. 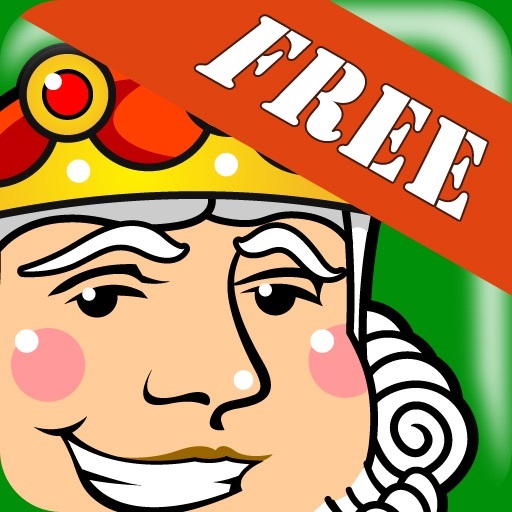 It's Kings Corners™ Free - a free version of our popular Kings Corners game. This free version is the same as the one you could buy, except that you'll see one ad while the program loads. That's it. No repeats, no interruptions. 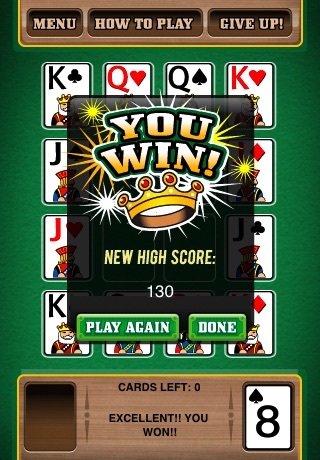 It's a simple, enjoyable card game for your iPhone and iPod touch. You'll need a little skill and a lot of luck to win, but you'll have fun trying. Game play is short - a game takes 2 to 5 minutes. Play it when you want a quick break, or a little reward for finishing a boring job. It's perfect for filling that short wait for your PC to reboot, or for your date to finish getting ready. And while it's challenging enough for an adult, it's so easy to play that you can even give it to your kids. Stop farting around - get Kings Corners Free now! 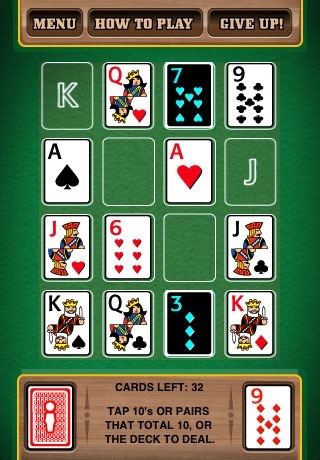 The applications Kings Corners Free was published in the category Games on 2009-01-22 and was developed by Ilium Software, Inc.. The file size is 2.22 MB. The current version is 1.0.1 and works well on 3.0 and high ios versions. 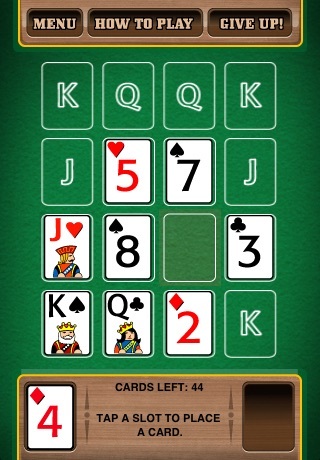 Do you like Kings Corners Free applications? Please share! Needs to be updated to work with IOS 11. Can’t play anymore!! I looked around a bit before I saw this. This a very close match to the version I had for the Amiga and PalmOS.. I really like this version on all my iDevices. It still plays well with iOS 5.1.1 & 6.1.2. I don't know about iOS 8 because Apple has stripped the Cool colorful and boldness from it so I won't switch to it. Thanks for making this game. I have this app installed on both my iPhone 5 and my iPad 3, and the problem is the same as reported by other reviewers ... the game almost always freezes before the 6th card is played. Otherwise, it would get five stars. Oh i love it its so cool get this app! 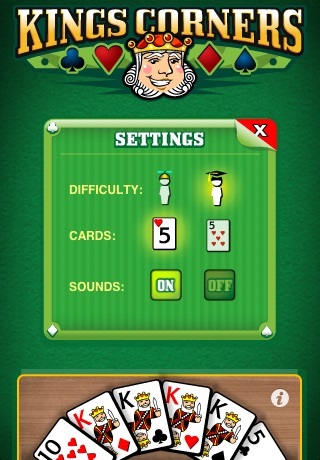 Game is fun, but since the update the game freezes after placing 3-4 cards. It seems like it's attempting to establish an Internet connection and, if you are indoors (at work) then the game just locks up until a connection is made. Other that that, it is pretty entertaining. I love the game and play a lot since the game play is so quick. However, I can't stand the new update with the ad that pops up all the time. If I get a text message or any other message while playing the ad appears. It is super annoying especially bc it is a bit delayed so when I touch to play I actually tap the ad so I am constantly being taken out if the game and into the app store! I would much rather prefer the ad to be at the bottom of the screen or something. 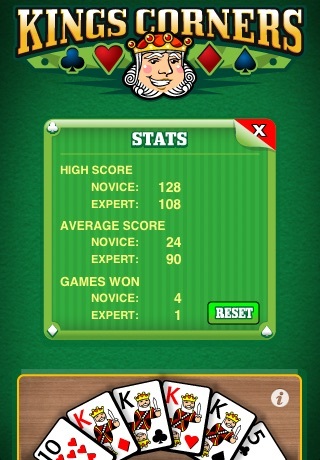 Is there a way to score higher than 130? How about a high score/date listing? That would be cool. Pointless changes. You just had to fall into the new "ad" world of apps too didn't you? If it ain't broke don't fix it. Wise up. It's a good game if you already know how to play. I just wish it had an undo button. Highly addictive! Great game! Give it a try, it's free and you won't be disapointed!